Astronomical Spring begins at 4:58pm as the most direct rays from the sun move north of the equator and daylight time continues to get longer in the northern hemisphere. For better record keeping, weather folks use climatological seasons offering more even three-month spans of similar weather. Climatological spring began on March 1. Today and Tonight: Beneath a sunny sky, highs will break into the low 70s on Wednesday afternoon. Light, northeasterly winds will continue and overnight will still be chilly in the mid 40s. A few clouds may result from a weak cold front crossing the area. 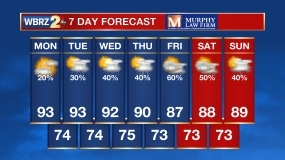 Up Next: The cold front will slip south Thursday morning but will not cancel warming, rather, keep it gradual with highs getting into the mid 70s and lows in the low 50s by the weekend. Nearly maximum sunshine will give way to some clouds by Saturday. The next significant shot at rain will hold off until at least Monday and it is too early to hash out any details on this one. Above average temperatures are expected into early next week. With spring beginning, we get the unfriendly, sneezing reminder that pollen season is upon us. You can get an updated allergy report each weekday morning on 2une In and every day from the WBRZ Weather Facebook and Twitter pages. 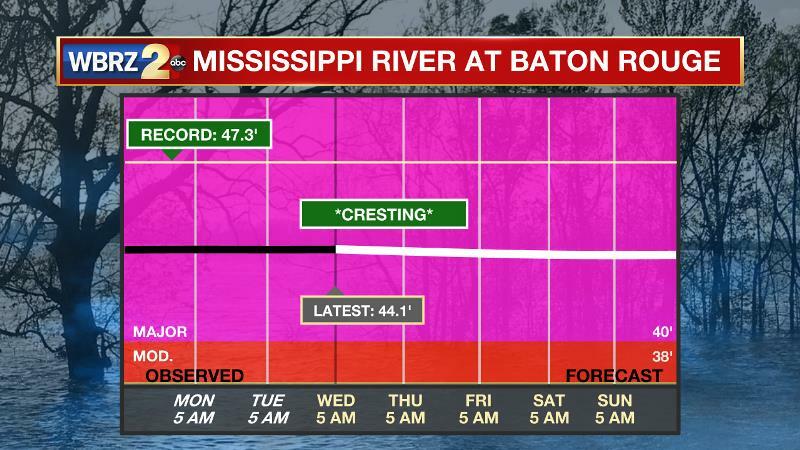 The Mississippi River: At Baton Rouge, major flood stage continues with a level of 44.1’ as of Wednesday morning. Due to runoff to our north, the river will stay near this crest for the next several days to weeks. The high water is primarily an issue for river traffic and river islands, although some inundation will continue for a few spots north and south of Baton Rouge that are not protected by levees. Unprotected low-lying areas will be flooded and agricultural operations will be impacted on the west side of the river. The grounds of the older part of Louisiana State University's campus become soggy. This includes the area around the Veterinary Medicine building, the Veterinary Medicine Annex, the stadium and ball fields. The city of Baton Rouge and the main LSU campus are protected by levees up to 47 feet. Some seepage may be noted due to the long duration of high water placing pressure on the levees. Water from the extensive Missouri River flooding across the Upper Midwest will not reach Baton Rouge until April and the Mississippi River is expected to have fallen some by that time. A weak, positively tilted shortwave trough will push through the area early Thursday morning with an associated decaying cold front. While some showers may be present along the boundary through north Louisiana and Mississippi, expecting to see a lack of moisture and declining lift negate this activity as it reaches the local area. Some clouds may pass. The main impact from the front will be a reinforcement of northeasterly winds allowing near average temperatures to continue despite abundant afternoon sunshine. A weak ridge axis will center over the region Friday into Saturday allowing readings to penetrate seasonable averages. By the weekend, a bit more moisture will stream into the low levels of the atmosphere allowing a few more clouds to develop. At this time, the next organized frontal system is pegged to cross the area on Monday and Tuesday by forecast model agreement is poor and therefore so is forecast confidence is timing and strength of this system.